How Natural is Your Calcium Supplement? Most people take a multivitamin pill without a second thought. Their doctors and natural healers alike recommend them. But did you know many types of synthetic calcium can be harmful to your health? Synthetic calcium supplements are usually derived from highly indigestible substances such as oyster shells and limestone. Only about 5% of any commercial calcium supplement is actually absorbed and used by the body. Many of these synthetic supplements aggravate arthritis due to the synthetic calcium depositing in the joints. This type of calcium can also deposit in the kidneys, causing kidney stones, and in the arteries, causing arteriosclerosis, leading to an increased risk of heart attack. Chelated forms offer slightly better absorption, but cannot come close to natural food and herb sources of calcium. Bone meal - bone meal originates from the bones of cattle that are ground into a powder. The FDA warns that bone meal may contain dangerously high amounts of lead. Dolomite - also known as calcium magnesium carbonate. The FDA warns that dolomite may contain dangerously high amounts of lead. Oyster-shell calcium - this is actually calcium carbonate, but it comes from oyster shells ground up into a powder. It may also contain too much lead and sometimes even mercury and cadmium (a cancer-causing agent). People who are allergic to shellfish should not take this supplement. Calcium carbonate - high in elemental calcium (40%), but dissolves slowly in the stomach and may not be well absorbed. Usually obtained from limestone. Found in many types of chewable antacids. May stimulate excess production of stomach acid. Calcium gluconate - only 9% elemental calcium. Not a good choice. Calcium glubionate - only 6.5% elemental calcium. Expensive. Dose is 12 teaspoons daily. Because these types of calcium are inorganic, they can deposit in the kidneys and in the joints, worsening arthritis and kidney stones. The consumption of inorganic calcium is one of the known causes of the "Sodium/Cholesterol ring" sign in the iris (colored portion of the eye). It shows up as white settlement around the circumference of the portion of the cornea visible in front of the iris. This sign is associated with hardening of the arteries (atherosclerosis, arteriosclerosis), calcium spurs, deposits and joint troubles, and sometimes cataracts (a hardening of the lens of the eye due to deposition of calcium). People with this sign complain of leg conditions and brain conditions due to insufficient blood flow to the brain. I suggest to anyone who desires healthy joints and arteries to avoid the inorganic form of calcium. If you are taking any of these medications, and if it’s possible, you need to try to taper or get off of them. Before you do that, you need to know which natural therapies will work for you instead. If you need suggestions, please email us or schedule a consultation with Dr. Foster. The Good News: What are the Herbs High in Calcium? Red raspberry leaves: are rich in magnesium, calcium, potassium, and iron, as well as zinc and phosphorus. White oak bark: the active ingredients are tannin and quercin. Quercin is similar in effect to salicin and is used along with bioflavonoids to strengthen the capillaries and veins. White oak bark also contains ample amounts of calcium, manganese, potassium and magnesium. Oat straw contains numerous minerals that aid in the development and maintenance of healthy bones, teeth, hair and nails, including an easily assimilable form of calcium. Many of the nutrients contained in oat straw are beneficial for the nervous system and may help to reduce premenstrual syndrome. The minerals contained in oat straw may also have an alkalinizing effect. Oat straw contains high amounts of vitamins A and C, as well as many B vitamins including vitamin B6, folic acid, niacin, riboflavin and thiamine. It contains low amounts of vitamins E, and K. Oat straw is rich in minerals such as calcium, chromium, iron, magnesium, phosphorus, selenium, silicon, and sodium; and contains low to average amounts of cobalt, manganese, potassium, tin and zinc. Additionally, oat straw contains protein and some amino acids such as arginine, histadine, leucine, lysine, phenylalanine, and tryptophan. What About the Milligrams of Calcium in Herbs? The calcium in herbs and plant foods is naturally-occurring and is immediately recognized and used as nutrition. Naturally occurring minerals in foods and herbs are organic. Organic minerals are well absorbed and do not leave toxic deposits in the body so the milligrams needed of this type of calcium is different than it would be for a synthetic type of calcium which is not well absorbed. Very important is to look at the herbs strength ratio if you can find it on any bottle of liquid extracts you find. If you can find a 1:1 or 1:2 ratio, it means the extract is quite strong. If it’s anything less such as 1:5 (most commercially available extracts), then you have a weaker extract, and you’ll need to take a much higher dose. With herbs, there is no unused excess to be deposited in the joints and bodily tissues. Horsetail and oatstraw are rich sources of natural silicon which is required as a base for the body to produce bone and cartilage. These are also excellent herbs for the skin since the skin requires silicon to be healthy. People are not used to the concept that herbs are nutritious foods and they naturally contain vitamins and minerals. This is probably due to very good marketing techniques used by vitamin and mineral manufacturers geared toward getting everyone to buy their synthetic variety. The official amount of calcium and magnesium that is typically recommended for adults is based on the absorption and availability of synthetic calcium and magnesium on the market and is not reflective of the amount of magnesium that is absorbed from herbs which are much more bioavailable (as it occurs naturally in foods and plants) than if you were to take the synthetic version (derived from limestone). 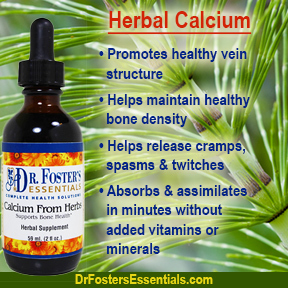 It’s important to understand that these herbs are high in many minerals – not simply calcium. In other words, you don't need to hunt down every single bone mineral out there in order to get the calcium from herbs to absorb. Nature provides the minerals naturally and they are well-absorbed. You can just take the herbs! What Else Can I Do to Strengthen My Bones? Get regular exercise. Some specifics are lifting light weights and working out in the weight room, doing mini trampoline exercises, but even just taking a walk can help. If you are menopausal or past menopause, trying adding Femme Pause to your supplement regime. Weak hormones can also cause dementia, memory loss and confusion as well as brittle bones and menopausal symptoms such as hot flashes and vaginal dryness. If you recognize these symptoms are your own, it’s important to support and strengthen your hormones as quickly as possible before a long-term loss of calcium due to weak hormones causes a noticeable drop in bone density. After receiving a required Hepatitis B vaccine for entry into medical school, Dr. Cynthia Foster became severely ill with grand mal epileptic seizures. The seizures occurred twice daily for almost four years – almost the entire time she was in training to become a conventional medical doctor at the University of Texas Health Science Center. Putting her life into the hands of a very experienced holistic nurse who was using holistic healing methods with unprecedented and extraordinary results, she refused all medications or other medical interventions for the seizures. Using only natural methods as her treatment, the seizures went into complete remission, and she has been seizure-free for over 20 years. Her first book Stop the Medicine tells the incredible story of her miraculous recovery as well as giving a behind-the-scenes look at the Modern Medical Establishment. In her search for healing, she has traveled the world learning and incorporating natural methods into her holistic practice, including herbal detox, natural supplements, aromatherapy, hydrotherapy, energy healing, mind-body medicine, healing visualizations, juice fasting and therapeutic foods. After receiving her MD degree, and refusing to practice medicine because of the miraculous healings she had seen in others and experienced for herself, she began her practice using only natural methods to heal her patients, specializing in teaching people how to heal themselves with simple remedies and techniques, and has been able to repeat the miraculous healing results with her patients that she herself had personally experienced. Over the past 20 plus years, she has served many roles including not only healing practitioner, but also herbal product trainer and spokesperson for herbal product companies, and also founded her own pharmaceutical strength herbal product line called “Dr. Foster’s Essentials” to address the health problems she was seeing in her practice. She noticed over a period of two decades of seeing patients, that they usually brought her grocery bags full of so-called “natural” supplements that simply did not work. She founded Dr. Foster’s Essentials, insisting on including herbal extracts up to ten times stronger than what is traditionally available in grocery stores, drug stores health food stores, and even online, as she felt these “mass-marketed” remedies were too weak and watered down to heal anything as serious as what she had experienced with the epilepsy. A highly sought after speaker and university instructor, she has lectured worldwide on a wide range of topics from the use of herbs to emotional healing to conventional medicine classes for acupuncture students. She has been interviewed numerous times on radio programs and mentioned in the press as well as featured in magazines, newspapers, and on television. Current projects include a second book describing how to use herbs and natural healing techniques to overcome life-threatening, chronic and incurable health issues.